One day early in November last year, patient partner and I decided to visit Ashdown Forest which in medieval times had been a deer hunting forest. More recently, its northern part (The Hundred Acre Wood) became the setting or ‘home’ of Winnie the Pooh and his friends. It was a cold and misty day, yet we felt excited, like explorers, ready to face an unknown wilderness. Moments later we stepped inside the safety of the Forest’s visitor centre (ha!). Can I help you?, we heard a cheerful voice address us, and soon after, equipped with detailed maps, we set off to explore the forest’s beautiful landscape and trees and autumn colours. It was magical. The next day we visited Ightam Mote, a 14th-century moated manor house, which has a Grade 1 listed dog kennel – see if you can find it. OMG, Queen Victoria!! Had I finally come face to face with a ghost? I stood mesmerised waiting for her pass through me. To my disappointment, she didn’t. But, she did acknowledge me very gracefully – oh dear I nearly curtseyed – before disappearing through one of the doors. 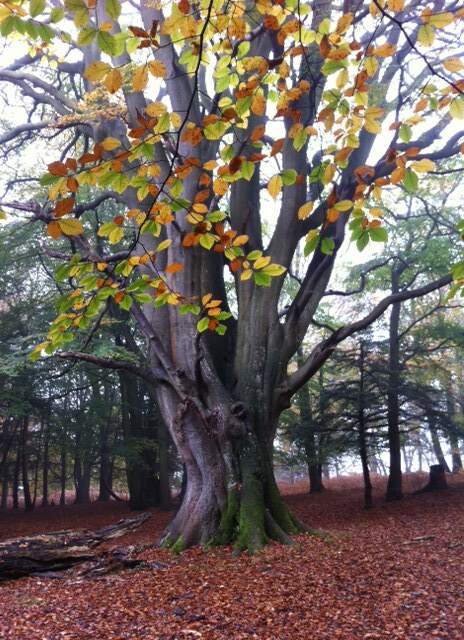 This entry was posted in My life in London and tagged ashdown forst, ghosts, humour, ightam mote, life, nature, photography, winnie the pooh on November 6, 2016 by germaninlondon. Oh my, exciting! Did you try to find her?? First of all the building is beautiful n u actually managed to click her? Is she for real?